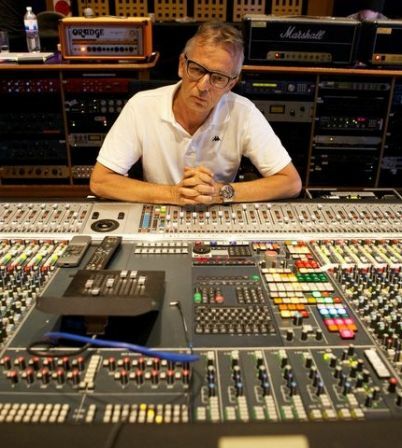 - How did you become sound engineer on Powerage ? When I left EMI Australia Vanda and Young asked me if I would like to be their apprentice/assistant which really blew me away. - Can you please explain us what was your role during the Powerage recording sessions ? I was the engineer for the album because up to then they had been doing it themselves so it gave me chance to observe their production style first hand. - How was your co-operation with Harry Vanda and Georges Young ? It was great, we were a team of three and became really close, us against the world so to speak. Alberts was like a real family atmosphere along with Fifa Riccabono who ran the admin side and Ted Albert who was the owner although he let us do our own thing with George and Harry running the show. - Were the tracks ready when AC/DC entered the studio or did they write songs and lyrics during the recording of the album ? 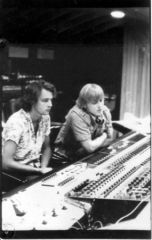 The tracks were not ready although Malcolm and Angus had some riffs etc and also Cliff had some visa problems so we rehearsed for 3 weeks without him with George playing bass and Harry and I in the control room. We did this at night, during the days I tested all the Marshall amp tops (8) with all the speaker boxes (16) to find the the best combo for Angus and Malcolm.I did this by myself until I ended up with one top and one speaker box for Malcolm and Angus. this also included finding the best speaker in each box. It took me about 2 weeks do that. - Powerage is the first album recorded with Cliff Williams on bass. How did he blend into the band's methods? Was he having carte blanche or was he rather following Malcolm and Georges' guidelines ? Cliff fitted in right away because he was a good guy who was happy to be there but at that stage he certainly followed George and Mal's guidelines while adding his own to it. - � and Powerage has a huge bass guitar sound. Deeper than any other AC/DC album that has been released before. What do you think ? Do you remember a specific wish on that bass-guitar sound concern from the Boys ? I think that was a combination of the equipment (Musicman Mustang and Ampeg SVT) Cliff and myself in the way I recorded him. - "What's next to the moon" exists in two versions: one with "normal" voices and another one with Malcolm and Cliff also singing along on verses which pumps the song up. Do you remember that change? who decided it ? When we finished it Atlantic didn't think the album was commercial enough so we went back and made a few changes as well as recording "Rock and Roll Damnation" as an extra track for the US release. - How was AC/DC working in the studio ? What were your feelings ? was the whole band included in the final decisions making process ? Who's leading ? Of course I thought it was amazing working with them, it was mainly Malcolm driving the band with George. Harry was also a great sounding board if there were stalemates. - Tell us a bit more about Bon Scott, the man, the singer. Bon was a rocker, gypsy and hippy combined. he was different to the rest and didn't take anything to seriously. the band would do the music first and then he would come up with the lyrics. Everybody in the band had distinct responsibilities, he was the singer so he had to write the lyrics. - In the studio, did you notice the guys were growing apart, developing distinct personalities ? 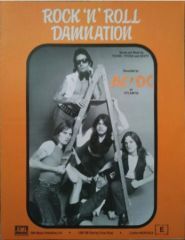 Not really, Bon was different to Mal and Angus and Cliff was the new boy trying to fit in with the band while Phil just pounded the kit and drove the rhythm section according to the riffs. We used to record at nights and in the morning Phil, Mal and I would sometimes hire a small motor boat at 9 in the morning and go fishing with some beers on Sydney Harbour, good fun. - Powerage is AC/DC's bluesiest album. How deep was the influence of the blues in the Young family ? Pretty deep, up until Let there be rock it was mainly rock pop so with this album we wanted it to be a lot heavier. - Do you remember what equipment you were using at that time ? The Young brother can't stop saying how much they still love analogic equipments. even when he went to the toilet. 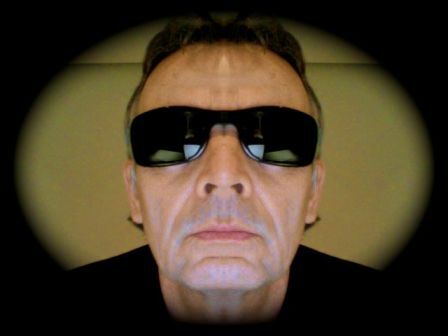 - Were Bon's musical opinions weighting a lot in the studio or was he only focusing on lyrics ? Was he only coming to the studio to record his takes or was he always around helping out the Young brothers with music ? 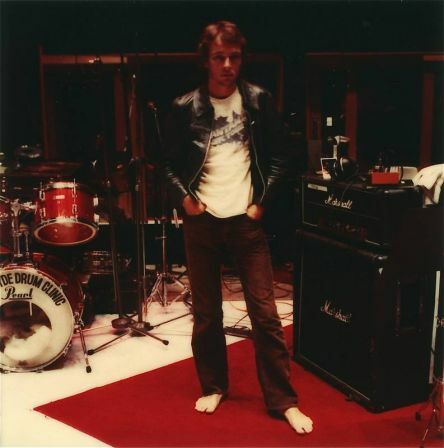 Bon was there for some of the rehearsals and all of the recording but mainly did his job which was write the lyrics and sing, the Young brothers controlled the music. - The Young Brothers wanted "Let there be rock" full of guitars. 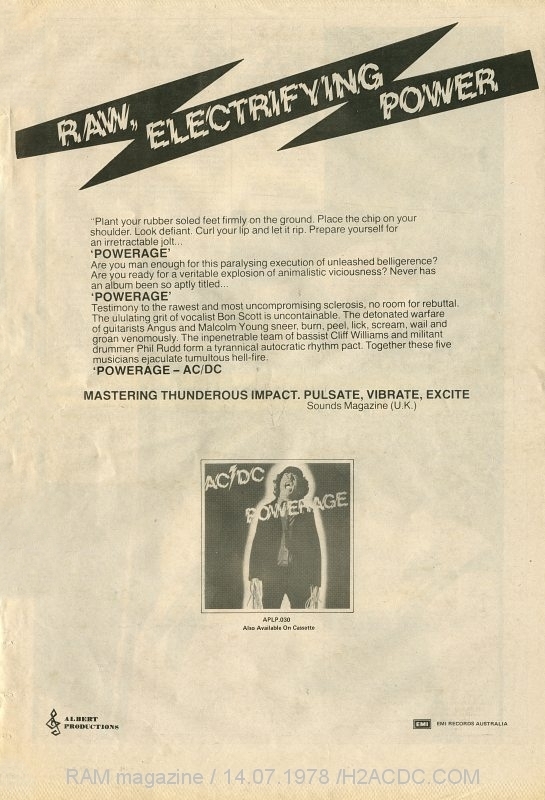 How did they want Powerage? 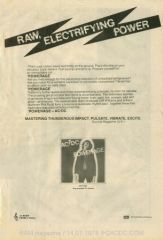 What was the watchword for Powerage ? Power, big guitars etc. I think that really stands out on that record. 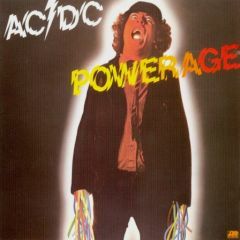 - 33 years later, what do you think about Powerage when you listen to it ? are you proud this album is often ranked as the best AC/DC recorded ? I think it really stands the test of time, most serious fans think it is their best. I also remember Gene Simmons (Kiss) telling me it was his fave by along way. Many other big players have said the same thing. I think Riff Raff is easily the best AC/DC song ever. I very very proud to have contributed to that record. I consider myself very lucky to be part of that chemistry. - Have you kept any material from the recording sessions ? Pictures ? Recordings ? Takes ? Jams ? No nothing, except for a Powerage jacket we were given. All outakes belong to Alberts and I did not have time to take pictures so it just the memories and the record which is enough for. - Did you keep in touch with the band? Have you seen them live lately ? - If you had not worked on Powerage, on which AC/DC's album would you have loved to work on ? All of them post Powerage, I did a little on Let there be Rock, one song I think. After Powerage Atlantic wanted them to work a new producer (Mutt) so George and Harry and I were out. I went on to INXS, the Angels etc so we didn't cross paths again although we did catch up at a gig at the Hammersmith Odeon in 1980 by which time I was A & R for Warners Australia. I would give my right arm to work with them again, particularly if Harry and George were involved. I would be happy just to engineer or whatever they wanted. That album was a big part in my life, I will never forget the experience not only the recording but everything else we did and talked about as well. Thanks for all Mark !